Takeaway: Even on those cold, cloudy winter days, it is possible to harness the power of the sun to help power your outdoor gardens. Sally Nex shares a few options. There’s no better place for watching sunlight turn into electricity than a garden—plants, after all, are just living solar panels, capturing light and turning it into the energy that fuels life itself. So there’s a kind of synchronicity in turning to the sun when you need power in the garden. At its simplest, using solar energy is as easy as popping a cloche over a row of winter lettuces to trap and intensify sunshine on frosty days, heating up the ground enough to keep everything growing strongly. But photovoltaic technology is becoming so sophisticated and versatile that nowadays we can harness the sun’s help for dozens of garden applications, from raising seedlings to lighting a path to powering the drill you use to build raised beds. At the moment, the default setting for powering everything from heated propagators to the radio you listen to while you’re working in the greenhouse is conventional electricity or batteries—plug it in, flick a switch and you’re cooking. But that’s like getting out the Chevy to drive the two-minute walk to the store. There’s a mismatch between what you need to do, and what you’re doing it with. In a garden, where you use a relatively small amount of electricity at intermittent intervals, you have all the energy you require already installed, and it’s shining out of the sky onto your head. Solar power is the obvious solution to so many of our gardening needs. You don’t need massive solar panels or complicated installations to power something as small and energy-efficient as a light, a garden fountain or a water pump—panels for this sort of application can be small enough to nail to a fence post. The smallest panels are often incorporated into the fitting itself. Sometimes it’s such a natural fit, it’s hard to see why we’d do it any other way. For example, automatic irrigation kits that only turn on when it’s hot and watering is required, or fountains we only want to bubble on warm, sunny days when we’re around to enjoy it. But solar power can boost electricity supply when it’s cooler, too. "If you have a greenhouse, you already own a giant solar panel. Just putting it up increases temperatures inside about 3-5 degrees above ambient air temperature outside." That’s because photovoltaic solar panels operate on light, not sunshine, and light still reaches the ground even when it’s cloudy, though usually at lower concentrations. That may cause difficulties if you’re trying to power a house, but if all you want to do is run a power drill, it’ll charge up a battery well enough. Photovoltaics are less efficient in winter, when light levels can drop to a third of summer levels as days shorten and the sun weakens, but you can still use solar power to heat your greenhouse in the depths of winter, even when the snow is thick on the ground outside, by using passive solar power. Also known as solar thermal energy, this is the low-tech end of solar power generation and easy enough to set up yourself without any special equipment required. The idea is that you capture and intensify the heat from the sun, a little like you do when using cloches, and direct it into something dense that stores the heat and releases it slowly—usually soil, water, bricks or concrete. If you have a greenhouse, you already own a giant solar panel. Just putting it up increases temperatures inside about 3-5 degrees above ambient air temperature outside. If it’s a lean-to greenhouse, capitalizing on the heat-retaining capacity of a house wall, it’ll hold onto that raised temperature for much of the night, too. You can boost this even more by installing the equivalent of a solar-powered heater in your greenhouse. Paint a metal radiator black, put it inside and hook it up to a circuit of metal plumbing pipes running under a seedling bed. As the winter sun heats the radiator, it warms the water inside. This sends it around the circuit, delivering a steady warmth to your young plants—your very own homemade, solar-powered, heated propagator. The same effect can be used to generate general heating, too. Fill black-painted barrels with water and stand them in the greenhouse. They’ll heat up rapidly in the most fleeting of sunny spells and then slowly release the heat into the air, keeping it frost-free even on the coldest days. Whether you use passive or photovoltaic solar power, the basic principles of harnessing the sun remain the same. To capture the maximum amount of light, you will need your capture medium, in as exposed a site as possible—often a house or shed roof, or the roof or sides of a greenhouse. You can also buy free-standing solar panels to put in an unobtrusive spot in the garden, or on a flat roof. These have the added advantage of needing no special equipment to install, so you don’t need to call the electrician in. Choose a site that faces more or less due south: anything from south-southeast to south-southwest is ideal. The further you stray from this arc, the less effective your solar collection will be. Check that the site is not overshadowed at any point during the day, including during the winter, when the sun can drop low in the sky. Again, the more exposure to sunlight, the better your energy efficiency. It’s important to angle the panels so they face the sun. In practice, this means sloping them back at an angle of 40-60 degrees from vertical. This holds true for passive solar energy collection, too: lean-to greenhouses made with a sloping wall from ground to wall, exposing the maximum area of glass to the sun, make the most of every scrap of winter sunshine. Judging the right size of photovoltaic panel to buy is tricky, as so much is variable: the weather, the efficiency of your converter and battery at storing the energy you collect, and how much power your appliance draws (a drill is much more power-hungry than a fountain, for example). As a rule of thumb, though, you should overestimate what you need by about 20% to make sure you don’t run short even in long periods of dull weather. Now that you know a bit about passive and photovoltaic solar power and their applications in the outdoor garden, here are a few more photovoltaic suggestions to apply to your outdoor winter garden. Probably the most popular way to use solar energy in the garden, these units store solar energy collected via a small photovoltaic panel during the day in batteries within the unit. Low-energy LED bulbs use a minimal amount of power, so you’ll get hours of lighting after dark for illuminating pathways and create dramatic lighting effects. Try highlighting a particularly architectural plant with an uplighter in the soil at its base, or use filters to cast multi-colored ripples across your foliage. Solar lights have no wiring, and the photovoltaic cells are usually built into the casing so you can move them around the garden to create different effects to suit your mood. You can even float solar lights on a pond. Wiring in water features and pond pumps can make installing a water feature a real headache, but if you use solar power, things become a lot simpler all of a sudden. Connect the valves and find a sunny spot nearby for the panel, and you’re done. The more power you supply, the more exuberant your water spout. If you’re keeping valuable fish such as koi, it’s worth noting that the pumps don’t continue to work after dark, so you’ll need an electrical backup for night-time use. Possibly the most sensible invention in the gardening range, automatic irrigation powered by the sun is sheer genius. You need to water most when it’s sunny, so use the sunshine to pump the water! The idea is simple: you set up the solar panel somewhere sunny to charge the battery, kick-starting a pump in your water tank to start delivering water through a pipe-and-dripper system to your plants. It keeps this up for around three hours, until the battery is exhausted, then stops for another three hours to recharge. The process takes longer when it’s cloudy, but that’s when your plants need less watering. It takes some trial and error to adjust the water flow until it’s just right, so stick around for the first few days to adjust settings. Once that’s sorted out, your solar irrigation system will do the rest for you, leaving you to get on with the fun part of gardening instead. Get serious about your solar-powered gardening and you can fuel outbuildings, greenhouses and sheds. 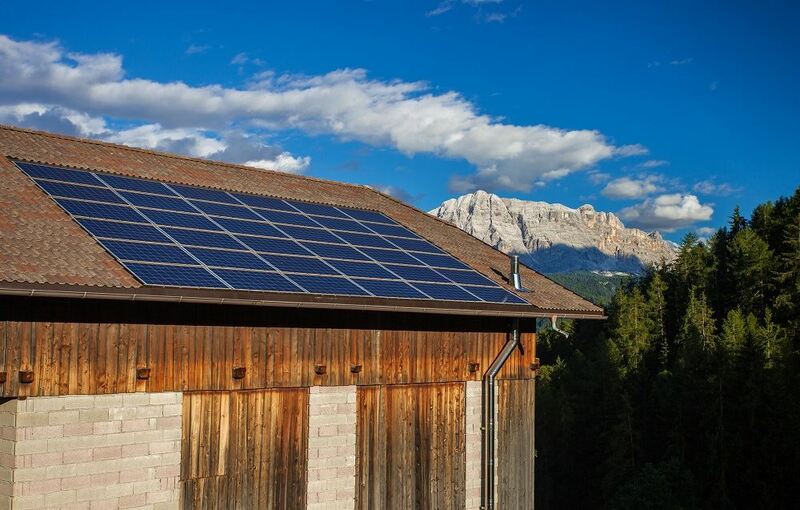 Shed roofs are great sites for framed photovoltaic panels. Standard crystalline panels will give you more power from a limited roof space, but if your garden building is larger, amorphous (thin film) models take up a little more room for the power they give off but work better in cloudy conditions. Just one 80-W solar panel attached to two 12-W leisure batteries should give enough electricity to power fluorescent lighting, external security lights, power tools and a radio. Double that to 160 W and you can run a fridge, laptop and even a TV. The latest, cutting-edge technology in the world of solar power is solar glazing: fine films of photovoltaic cells embedded within glass, so you can collect power from your windows. When you glaze an entire solar greenhouse in it, it generates so much energy, you can power your house, too. It’s not a cheap option, but you’ll get 600 kWh a year from an 8-ft. by 12-ft. model—enough to supply about three-quarters of a household’s average power needs. The technology is still in its infancy, but expect to see more of photovoltaic films. They could change the face of power generation in the garden, and elsewhere, forever. Can You Sterilize and Reuse Your Grow Media? What Type of Solar Kit Do I Need To Run My Grow Lights?